Why go to the jewelry store when you could commission one of a kind custom rings just for you? 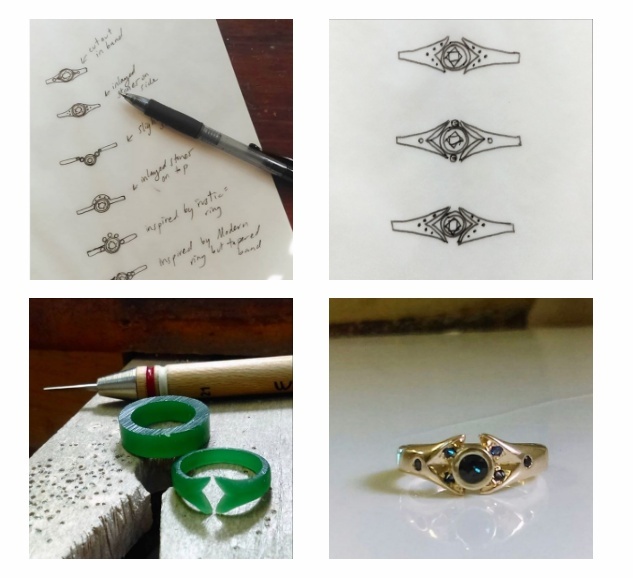 I get lots of questions about the process of designing and creating custom wedding and engagement rings, so I thought I’d share! The photos above show the making engagement ring from the first thoughts to the final piece. For this ring, the client wasn’t sure what he wanted, but knew the ring needed to fit in with his fiancee’s active lifestyle. I started out by just drawing lots of ring ideas that were modern but still a little romantic. After a few rounds of sketches I took his feedback and we narrowed it down to a final sketch. My favorite part is the wax carving. It’s a very slow and meditative process to carve a block of wax into a delicate and perfectly sized ring with teeny tiny chisels. Next, the wax was put into a mold and molten hot gold poured in to create the ring! Definitely the most exciting part of the process. You can pick silver, rose gold, yellow gold or white gold. Finally, you can choose any stones you like to complete the ring design. I recommend sapphires because they are almost as hard as diamonds, and come in a huge variety of colors. For this ring, he chose classic blue sapphires as a unique alternative to diamonds. I would love to make you something completely one of a kind!